There’s a new robot in the AUC Robert W. Woodruff Library! Meet VGo, a robot specially designed for teleconferencing. VGo moves (literally) beyond more “stationary” methods of teleconferencing such as Skype, GoToMeeting, and the like because the user can physically control the robot to move since this robot is on wheels. In a demonstration, library staff watched VGo roll up to a desk, tilt the camera angle, and then – upon the screen – we saw the user who was several states away at the time of the teleconference. Using the robot, the demonstrator was able to turn slightly to face the speaker and adjust his camera angle for the most advantageous view of the conference room. VGo uses WiFi or 4G LTE and, while it can go a full 8-10 hour day on one charge, it can also navigate itself back to its charging station when the time comes (think: Roomba vacuum). It is up to AUC staff to come up with creative ways to use the robot. Some preliminary ideas include using the robot on our uppermost floor while a staff member at the information desk a floor below answers student queries coming through the VGo. It could be useful in the graduate study suite where there is not a regular librarian on duty. Again in this case, VGo allows a librarian to have a virtual presence with which the graduate students can interact. For any staff member who wanted to be virtually in 2 places at once, this may be the solution! A/V Edting Suites:Will you make the Final Cut? Within the Technology Design Studio, (the digital hub of the AUC community) there are hidden gems. These gems include two audio and visual editing suites full of technological goodies. Although our iMac computer lab is well trafficked, there are few who venture further and utilize our suites and the treasures just behind the striped, frosted windows. 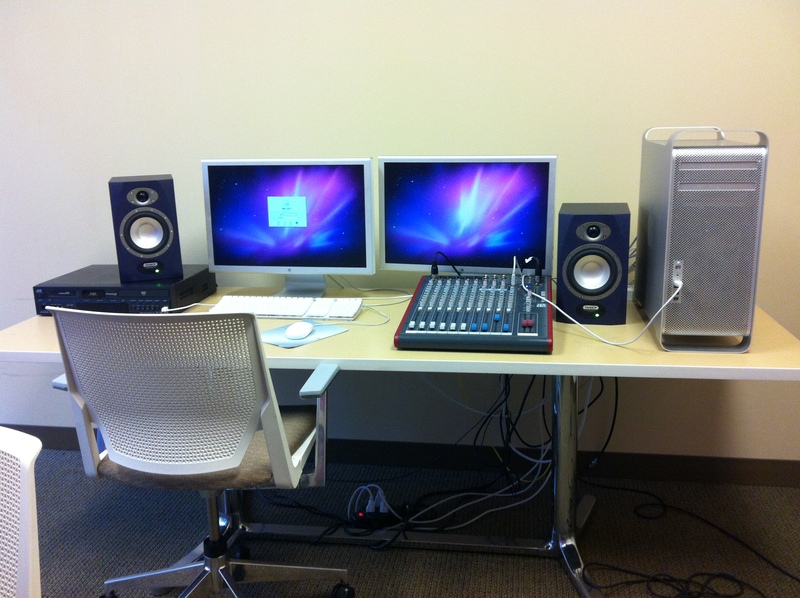 Housed in the rooms is a Mac Pro computer equipped with professional editing software and dual screens to maximize workspace, an omnidirectional microphone, a 14-channel mixing board, DV/DVD video recorder (suite 206), and a meeting table. To successfully edit and save a project you will need knowledge of the Final Cut software, an external storage device (preferably an extended hard drive), the media you are editing, and most importantly, ample time to edit and render your project. Four steps make up the editing process. First you will need to import your media into the Browser window. After your media is imported you will then select an In and Out point using the Viewer window, or click and drag your clip to the timeline, located in the lower-area of your screen. Note: Whatever is on your timeline is included in your final project (shown in the Canvas window). Next, add an introduction, credits, transitions, text, motion, and sound effects to further enhance your video. Review your video after adding effects. Is your sound in sync with your video? Are your transitions smooth? If the answer is yes; you are now ready for the grand finale: writing and exporting. How long does it take to write and export a video? Let’s just say it will take approximately twice the total length of your video. For example, if you have a ten-minute presentation, allow twenty for exporting. To expedite the process choose to send your finished product to an external storage device. 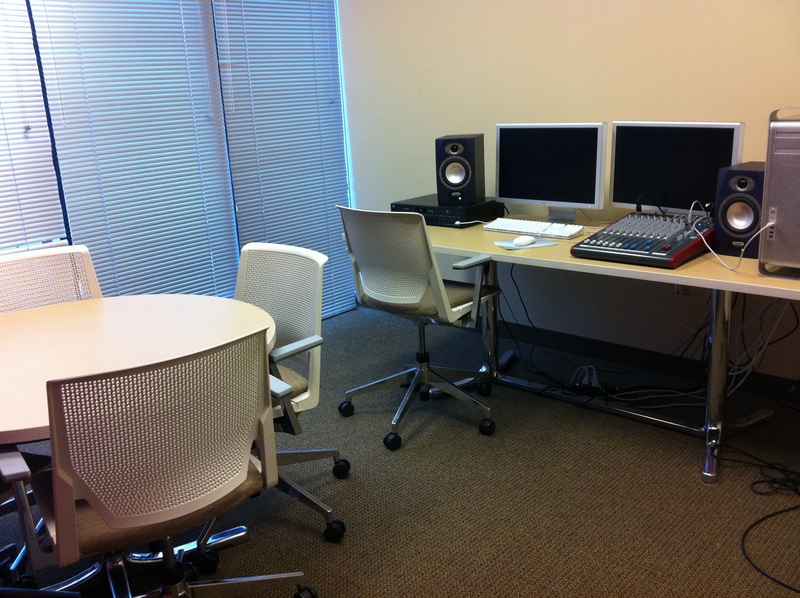 The audio/visual editing suites are available by reservation to faculty, staff, and students of the AUC community. With a valid, school-issued identification card, rooms can be reserved for a maximum of three hours at the Technology Design Studio service desk.